There is no doubt that our Supreme Lord, Allah (SWT) did not create this universe in vain. He created it and all it contains for the benefit of His creatures in common and for His devoted and pious slaves in particular. And He created us for the sole purpose of worshipping Him Alone without ascribing partners or setting up rivals to Him. Hence, He sent Prophets and Messengers to clarify the Message and convey it to their people. He blessed them with different miracles and signs to prove their Messengership and Prophethood and as followers the mankind are instructed to believe in them and the miracles they were given and blessed with. Our beloved Prophet and Messenger, Muhammad (PBUH) was also blessed with many miracles. 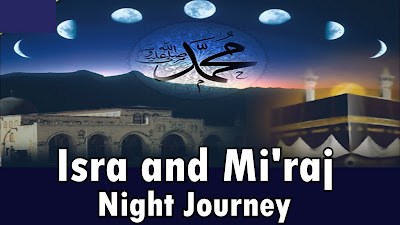 Al-Isra and Al-Miraj (The Prophet’s miraculous night journey) is one of those great miracles. After the death of Abu Talib (Prophet’s uncle) and the mother of the believers Khadijah (RA), Quriash became more vile and harsh in their harm and persecution. The Prophet (PBUH) went to AT-Taif, conveying the Message of Islam and hoping for help and support from its inhabitants, but instead he (PBUH) received a hostile and harsh welcome from its people and their leaders. They not only refused to accept the true message of Islam, but also hurt him with severe injuries, they blooded his face and sent their messenger to Quraish, informing them about his calling to Islam. As a result, the Prophet (PBUH) entered his hometown Makkah under the protection of a disbelieving man. By occurring such sad events, this year was known as the Year of Grief. But then such unpleasant events came to an end and relief came to the Prophet (PBUH). A miraculous night journey occurred, a journey from the Sacred Mosque (in Makkah) to Jerusalem and then to the heavens. When Al-Isra and Al-Miraj took place? At-Tabari said: The Night Journey occurred during the year in which Allah (SWT) honoured His Prophet (PBUH) with Prophethood. Al-Qurtubi and An-Nawawi preferred that it took place five years after the beginning of the Prophethood. A well-known writer of biography of the Prophet (PBUH), Allamah Mansurpuri preferred that it was the night of 27th of Rajab during tenth year of the Prophethood. Some said that it was 16 months prior to the migration to Al-Madinah. It occurred one year and two months prior to the migration to Al-Madinah. Others said that it was one year prior to the migration. The first three views and opinions are based on the death of the beloved wife of the Prophet, Khadijah (RA) which was in 10th year of the Prophethood. She was passed away before the five compulsory prayers were made obligatory, and there is no difference among the historians and writers of the biography of the Prophet (PBUH) that the five daily prayers were made obligatory during Al-Isra and Al-Miraj. And as for the remaining opinions, there is no authentic or clear evidence to prove the preference of one over the other. Then, during that night he ascended from Bait Al-Maqdis to the lowest heaven. Jibreel (AS) sought permission to enter, it was opened to them and the Prophet (PBUH) met Adam (AS), greeted him, Adam (AS) welcomed our beloved Prophet (PBUH) and expressed his faith in Muhammad’s Prophethood. Then, they ascended to the 2nd heaven, where the Prophet (PBUH) met Yahya (John) and Isa (Jesus). He (PBUH) greeted them and they returned his greeting, welcomed him and expressed their faith in his Prophethood. Next, they ascended to the 3rd heaven, they entered and the Prophet (PBUH) met Yusuf (Joseph) (AS), he greeted him and Joseph (AS) returned the greeting and expressed faith in his Prophethood. Next, they ascended to the 4th heaven, they entered, and the Prophet (PBUH) met Idris (AS), the Prophet (PBUH) greeted him, and he returned the greeting and similarly expressed his faith in the Prophet’s (PBUH) Prophethood. Then, the Prophet (PBUH) was carried to the 5th heaven, and there he met Haroon (Aaron) (AS), the Prophet (PBUH) greeted him, and he returned the greeting and expressed faith in his Prophethood. Next, the Prophet (PBUH) was ascended to the 7th heaven, where he met Ibrahim (Abraham) (AS), the Prophet (PBUH) greeted him, and he returned the greeting and expressed faith in his Prophethood. Then, bait al-Mamoor was shown to the Prophet (PBUH) (the much frequented house) circumambulated daily by seventy thousand angels, so that the angels who once circumambulated it would not have their turn again till the Resurrection. Jibreel (AS) carried the Prophet (PBUH) to Sidratul-Muntaha (lote-tree of the utmost boundary, beyond which none can pass). Its fruits were like the large jars of Hajar. Next, the five daily prayers were made compulsory by Allah (SWT) to this nation. At beginning they were fifty prayers for each and every day. On return the Prophet (PBUH) met Moses (AS) once again and he asked the Prophet (PBUH): “What were you commanded with?” The Prophet (PBUH) said: “I was commanded to perform fifty prayers each and every day.” Moses (AS) asked the Prophet (PBUH) to go back to your Lord and ask Him to decrease (the number of prayers) for you nation. The Prophet (PBUH) went back many times until the number of prayers decreased to five daily compulsory prayers. After the completion of the night journey, the Prophet (PBUH) returned to his hometown Makkah. In the morning he (PBUH) told the polytheists about it. They mocked, quarreled and as usual disbelieved in this great miracle. The Prophet’s miraculous night journey ended up being a difficult test for certain people who had believed in the Prophet’s calling to Islam, a test that some of them failed, for they ended up apostatizing. Some people went to Abu Bakr As-Siddeeq (RA) and said to him: “Will you not go to your companion (the Prophet PBUH)? He claims that he made a journey during the night to Jerusalem!” Abu Bakr (RA) said: “And did he say that?” They said: “Yes.” Abu Bakr said: “if he said that, then has spoken the truth.” On such occasion the title of As-Siddeeq (the Truthful One) was given to him by the Prophet (PBUH). There are various purposes behind this miraculous journey. The main purpose was that Allah (SWT) wanted to grant His Prophet (PBUH) a chance to see some clear and vivid signs of His Almighty Power, so that the Prophet’s heart could become comforted and filled with trust in Him, and so that His Messenger (PBUH) could increase in strength, strength that he would need to carry on his struggle against the polytheists and disbelievers of Makkah and beyond.